Note: One of the first articles that I wrote for my Interactive Journalism grad program at American University. I had to do a quick turn-around story on memorial tours in DC. The weather was horrible (rain, sleet, snow) and I was woefully under-dressed. Reading it over post-graduation I see what I would’ve done differently and better in regards to how I wrote the story and the media usage, but the experience alone made it worth the effort. It taught me persistence in regards to getting the story and to always have a back-up plan in case your story takes a different/unexpected turn. 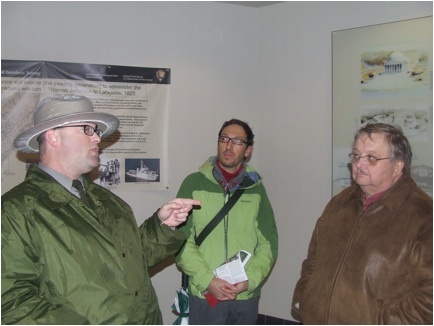 “Neither snow nor rain nor heat nor gloom of night stays these couriers from the swift completion of their appointed rounds.” This unofficial motto of the U.S. Post Office can easily apply to U.S. Park Service Tour Guide Brad Berger. 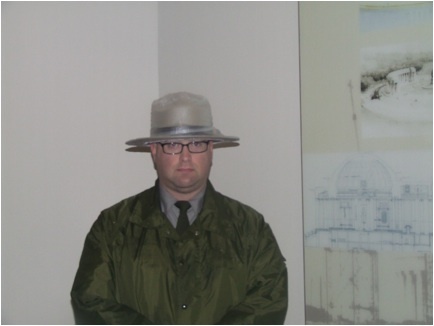 Mr. Berger has been with the U.S. Park Services for over eight years. As part of his job he provides bike and walking tours of the various Washington, DC monuments and memorials such as the Jefferson, Franklin Delanor Roosevelt and the Lincoln. On this Saturday morning, Berger was scheduled to give a walking tour starting at 9 am, but the weather was not exactly tour-friendly. The temperature was in the low 30s and wind and rain was whipping across the area. Inevitably the rain turned into snow, which made for slippery sidewalks and muddy walkways. In Washington, DC when you have weather this bad everything gets cancelled. Berger looks like a Hollywood-version of a park ranger. He is a tall, square-jawed solid-looking man with dark-framed eyeglasses. Dressed in a long green rain padded raincoat, green shirt, green tie, comfortable, weatherproof shoes and a beige ranger hat. He did not wear gloves nor carry an umbrella. Berger looked neat and ready to take on the elements and answer any questions. The tour group looked a little less imposing and a bit daunted by the weather. The group was a small one, consisting of four people of various ages. The group looked wet and cold yet determined to take the tour. The tour started at the Jefferson Memorial and immediately Berger was in his element. 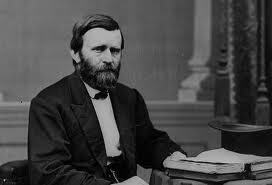 He voice was crisp, his enunciation clear and his enjoyment of history was immediately visible. Berger said that he tries to leave “no stone unturned” in providing his tour groups with information about the memorials. Berger went over the usual historical facts about iconic figures and events such as Thomas Jefferson, FDR, Abraham Lincoln, the Korean War, and the Vietnam War. 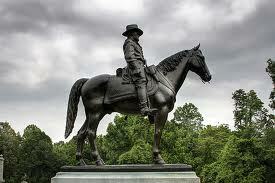 He also talked about lesser-known memorials dedicated to George Mason and engineer John Ericcson. Berger’s knowledge of history is not from being a tour guide. His love of history started as a youth. He said that when he was little he was always reading history books that he borrowed from uncle. Berger said the was a “weird kid.” Eventually this history buff went on to get a B.A. in European History at Shepherd University in Virginia and a Master’s in American Colonialism at Shippensburg State University in Pennsylvania. 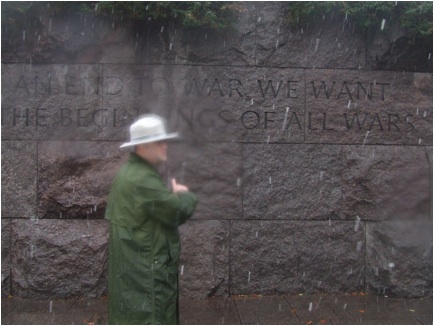 As the tour wound its way across the various memorials the temperature dropped and the snow came down harder. The tour group was getting cold. Zanoletti said “It’s Survivor DC” as he kept his head down to head off the snow and rain. Sorrentino said that he was doing “okay” but he looked a bit wet. Berger didn’t seem the least bothered by the weather nor did he let if affect his tour. In fact, Berger boasted that he used to “run in shorts” in this type of weather while stationed at the Air Force’s South Bavaria, Germany site.